In writing about visualizing survey data using Tableau, I’ve found that the number one impediment to success is getting the data in the right format. With Tableau 10 and on, it is, in fact, possible to get your survey data just so without having to invest in new tools and/or a engage in a time-consuming, error-prone procedure every time you need receive updated survey data. Metadata that describes the survey data. There’s a lot of upside to using Tableau to get your survey data just so. Everything is built into Tableau and you’ll just need to refresh the extracts (there will be several of them) as you get new data. The downside is the setup is a little bit cumbersome and some of the steps can be confusing. Let me walk you through an example. If you'd like to follow along, you can download the data source here. Anyone that has read my posts or attended my classes know that I want survey responses in both text and numeric formats. Sure, you can in fact manage with one format or the other, but you’re just creating a LOT more work for yourself if you don’t have the data in both formats. You will also need what I call a “helper” file. This is just a separate file that maps each question ID into human-readable form and groups related questions together. Again, you can certainly get by without it, but you’ll be working much harder than you need to, especially if you ever compare “importance” with “satisfaction” Likert-scale questions. For this example, we will create a separate extract for each of these three files, then use Tableau’s ability to join three different data sources. Let’s start by creating the extracts. 1. Start Tableau and indicate you want to connect to Excel. 2. Connect to DR_SurveySampleData_SourceFiles_Fall2016.xlsx and drag the sheet Data Labels into the "drag sheets here" area as shown below. 3. Leave the first five columns intact (the Resp ID, demographic stuff, and Weight) and select all the other columns. 4. Click any of the selected columns and select "pivot" from the context menu. 5. Rename the first pivoted column "Question ID" and the second column "Label" as shown below. 6. Indicate that you want to create an extract (look for the radio button toward the upper-right corner of the screen) and then click a sheet in your workbook to generate the extract. 7. When asked to save, name the file DR_JustSo_Labels.tde (make sure to note where you are saving the file). 1. Click the New Data Source icon and indicate you want to connect to an Excel file. 2. As before, connect to DR_SurveySampleData_SourceFiles_Fall2016.xlsx, but this time drag Data Numbers to the "drag sheet here" area. 3. Hide the columns labeled Gender, Location, Generation, and Weight. We already have them in the other data source and don’t need them twice. 4. Leaving Resp ID in place, select the second through the last columns. 5. Click the down arrow on any of the selected columns and select "pivot" from the context menu. 6. Rename the first pivoted column "Question ID" and the second column "Value," as shown below. 7. Indicate that you want to create an extract (look for the radio button toward the upper-right corner of the screen) and then click a sheet in your workbook to generate the extract. 8. When asked to save, name the file DR_JustSo_Numbers.tde. 2. 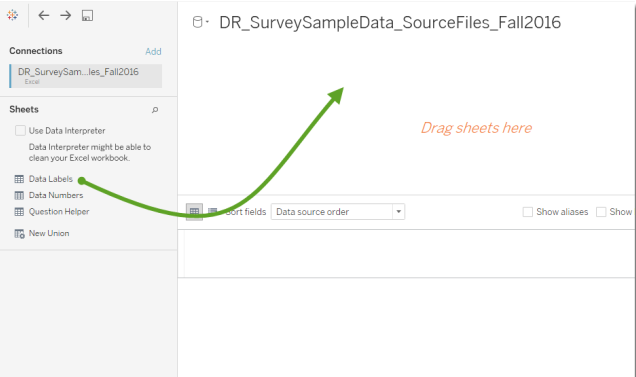 As before, connect to DR_SurveySampleData_SourceFiles_Fall2016.xlsx, but this time drag Question Helper to the "drag sheet here" area. 3. Indicate that you want to create an extract (look for the radio button toward the upper-right corner of the screen) and then click a sheet in your workbook to generate the extract. 4. When asked to save, name the file DR_QuestionHelper.tde. All three data sources are now ready. We now have our three data sources as separate Tableau extract files. We’ll combine these three files (and create an extract from the joined files) using Tableau 10’s ability to join files from different data sources. This is where things can get a little confusing. Note: When I first tried this, Tableau presented a lot of warning messages about not being able to materialize a temporary table. While I could ignore these warnings and muddle through, you may not be so lucky. It turns out the culprit was my anti-virus software. I temporarily disabled it and everything worked without a hitch. See this Knowledge Base article. 1. Click the New Data Source icon and indicate you want to connect to More, as shown below. 2. Select DR_JustSo_Labels.tde and click "open." 3. Click Add, as shown below. 4. Click More and select DR_JustSo_Numbers.tde. Do not be fooled—the correct fields have NOT yet been joined. 5. Click the overlapping Venn diagram to display the join dialog box, as shown below. 6. Click Number of Records and click the X that appears in the row to indicate you do NOT want to join these two data sources using this field. 7. From the left data source, indicate you want to join using Resp ID, as shown below. 8. From the right data source, indicate that you want to join using RespID (Extract1). I have no idea why the field is named this way. More on this in a moment. 9. From the left data source, indicate that you want to join using Question ID. Yes, you need to join on more than one field. 11. Click Add again, select More, and select DR_QuestionHelper.tde. 12. Click the second Venn overlapping circle and remove any of the joins that may be in there (most likely again using Number of Records). 13. From the left data source, select Question ID, and from the right data source, select QuestionID as shown below. 14. 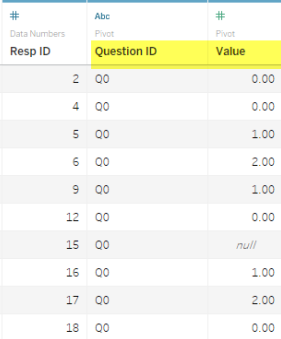 Hide the fields RespID (Extract1), both Number of Records fields, the second Question ID, and Pivot Field Names, and rename Pivot Field Values to Value. Your screen should look like this. 15. Indicate that you want to create an extract (look for the radio button towards the upper-right corner of the screen) and then click a sheet in your workbook to generate the Extract. 16. When asked to save, name the file DR_JustSoAll.tde. After creating the extract Tableau will show all the field names grouped by data source, as shown below. So, how do you get the extracts to refresh? Good question. If you are using either Tableau Server or Tableau Online, you can create shared data sources and program the extract to refresh on a regular or as-needed basis. If you are using Tableau Desktop and you have all four data sources in in one workbook, you can just click the Data menu and select Refresh All Extracts. While I find the process outlined here both cumbersome and confusing, this approach does appear to work and you only need to set it up once. The same cannot be said of the Tableau add-in for Excel which requires a lot of manual intervention every time you want to update the data. Will this replace Alteryx as my tool of choice? No, but it does work and you can’t beat the price. For more tips and tricks on working with survey data, check out Steve's upcoming virtual class on visualizing survey data. This is super-helpful, but in Tableau 10.5.2, I'm only seeing hyper extracts. I tried these steps otherwise exactly as written. When I followed these steps I can get all the way to the step 16, but the extract will not save. I get many different errors- some saying I don't have enough space (so I tried saving it to a network drive), no avail. Also, I've gotten a memory error, but the byte size that it says it needs is only about 16 MB. Overall, it looks like my workaround is to just import the SPSS file and join the extracts. That has worked okay so far, but the file extract is very slow. If you have any recs for how to use hyper extracts to get the data just so, that would be lovely.